Strapped For Cash, Music Fans Let Go Of CDs Several major record retailers around the country have reported significant increases in their supply of used CDs. Since the economic crisis began, more people have been bringing in CDs to sell for cash or store credit. Both Amoeba Records in California and Newbury Comics in Boston see the same trend. At Amoeba Records in California, more people are selling CDs than buying these days. 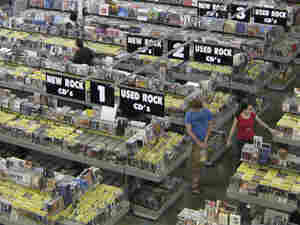 California's Amoeba Records is the largest used-music retailer in the world. The checkout lines often wind deep into the clearance aisles. But not lately. These days, the real action comes from people selling their collections — and using the store as an emergency ATM. "We're getting people bringing in bags and suitcases and just bulk," says Tony Green, who manages the Amoeba outlet in San Francisco. "They're just selling everything." Gabriel Stricker came with 400 CDs. A CD buyer at Amoeba offered him a surprising financial insight. "He said, 'I could have told you months before any of the economists that the economy was going into the dumps,' " Stricker says. "Because, instead of the spare change from under the sofa, [sellers are] basically looking around their house for anything that they could convert into cash." 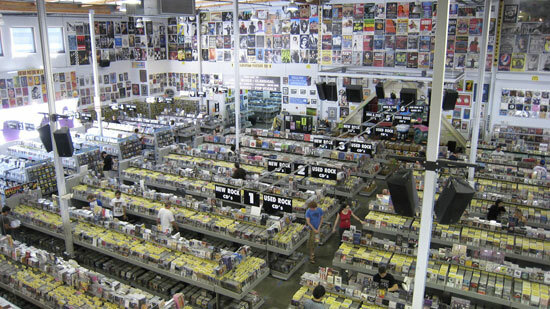 To manage the supply of CDs, Amoeba had to cut back on the amount of money it can offer. The used-CD market is booming in the Northeast, too. CD sellers have been streaming into Newbury Comics in Boston, unloading their Celine Dion and Red Hot Chili Peppers albums. "We'll see 20, 30 people a day that will bring in five to 20 CDs or five to 20 DVDs," says Sara Fee, who works at Newbury's Faneuil Hall location. She says that about 75 percent of their sellers are motivated by the payout. "We hear a lot of sob stories, unfortunately," Fee says. "People that need money for bills or need money to live." Back in the Bay Area, Amoeba has been buying so many used CDs, the extras are piling up in its Oakland warehouse. Green comes twice a month to drop off the surplus. Boxes and boxes of CDs are stacked on pallets along the floor. "I would say there's probably about 60 pallets," Green says. At 6,500 CDs per pallet, that's nearly 40,000 CDs. Amoeba will sell some of them during the summer tourist season. They'll ship the rest off to other stores in the U.S. and abroad. Peter Wall came to Amoeba to sell some of his old punk CDs. He says he started feeling a cash crunch when the bookstore where he works cut his hours. Then his car broke down. "It was paycheck to paycheck at that point," Wall says, "and that just put me under." Wall is looking for another job while he sells books and CDs for extra cash. He says he saves his money in a cat-food dish in his room until the first of the month. "Rent," he says. "Everything goes towards rent." For other sellers, parting with a collection that took a lifetime to curate can be emotional. Stricker compares his CDs to grains in an hourglass. "You go to the store and turn it upside down," Stricker says. "And it's just evaporating away. That was my experience, watching the sands of this hourglass going away, just tick tick tick ..."
Amoeba's buyers are sort of like bartenders: They bear witness to the stories of each CD. Stricker sat for an hour and a half while the buyer catalogued his beloved collection — including the first CD he ever bought, by James Brown. "Instead of dropping them off and having them be gone," Stricker says, "I could actually process it with them. It was just slowly letting it go." Stricker's not strapped for cash, though. He's plans to spend his entire payout on more CDs.